Curly hair will never go out of style, and that's why it's important that you have the best curling iron for your hair so you can boast beautiful, beachy waves or tight curls any day you feel like being flirty and fabulous. The market for curling irons can be confusing, and some of our readers may not even know which sized barrel to get for their hair type. We understand this and are excited to share with you ten of the best curling irons available on the market for this year. We found and answered a few important frequently asked questions that will help you familiarize yourself with curling irons and the market. 1. How to Curl Hair with the Best Curling Iron? Depending on the size of your curling iron and the technique you use to curl it with, you can create a ton of versatile looks. If you want soft, tousled waves that look as though you've just spent a day at the beach, you'll want the best curling iron with a barrel that's at least one inch in diameter. If you are interested in achieving runway-quality waves that are big, loose, and voluminous, you can channel your inner model by using a larger barrel or curling wand that is over one inch in diameter. 2. Hair Curling 101 with the Best Curling Iron? Make sure you keep in mind that curling hair is more than just buying any old curling iron and attacking your hair with it. There are specific techniques you should use that will help you achieve the results you desire. You should always use a heat protectant on your hair before applying any heat styling tools to it. This will help protect it from any heat damage and will minimize breakage from your hair getting dried out from the heat. This will also help keep your hair looking healthy and fresh like you've just stepped out of the salon. If you can help it, keep the temperature of your iron (or any heat styling tool) at four-hundred degrees or less to help prevent heat damage. Especially if you have finer hair, you'll absolutely risk burning it if you keep the temperature any higher. If you are looking for a natural look to your curls, ​curling hair​ that frames your face in the direction away from your face will create that desired look. If you have short hair, facing the barrel of the iron downward as you curl will help you curl your hair more effectively. If you have long hair but not a lot of time to curl it, dry your hair and put it into a high ponytail, split it into sections, curl it, and then let it down for voluminous and wavy hair. Keep in mind that the smaller the barrel of a curling iron is, the smaller and tighter your curls will be. The larger the barrel is, the bigger and looser the curls will be. 3. What Type of Best Curling Iron Should I Use for My Hair? Whether you have fine hair, thick hair, or something that falls in-between you won't be lacking in choices when it comes to finding the perfect one. Fine hair is prone to breakage from heat treatments, so it's important to find an iron that offers low heat settings and the ability to control those settings. If you are worried about achieving an even heating for your hair, invest in ceramic barrels or barrels made with a combination of ceramic and tourmaline materials. These materials will also prevent any unexpected hot spots that could potentially damage the hair. 4. 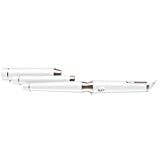 Overall Price Range for the Best Curling Irons? As with many consumer products, the pricing will rely on what the customer is willing to pay. For our top ten list, we chose only those items we feel offer the best value for the money and are excellent choices for our budget-conscious readers. The overall price range for our top ten list is $11 to $270. Our team spent much time and effort researching different curling iron models to bring you this unbiased best-of list featuring only the ten best irons on the market. This best curling iron heats up quickly and works perfectly. It has an automatic shut-off function in case you forget to unplug it. It uses multi-layer technology that combines elements of nickel, copper, chromium, and steel for long-lasting lustrous hair results. If you are someone who desires to have tight, polished curls one day and loose, textured waves the next, this best curling iron is perfect for your needs. The set comes with a base that has five detachable barrels: two wand style and three clip style that range from 0.3 to 1.25 inches in diameter. The variety makes this an ideal set for both long and short hairstyles. The cord is eight feet long for plenty of length for styling. Multidirection 2" barrel rotates to add volume and shine. 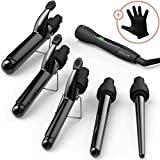 This best curling iron is great for those who are seeking a curling iron engineered with advanced technology to achieve flawless curls and waves every time. This curling iron is made with Nano titanium and uses far-infrared heat to promote smooth and frizz-free curls each time you use it. 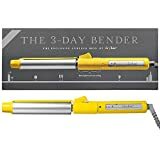 This is a great curling iron for those seeking a quality iron that eliminates frizz and provides major curls, waves, and volume for a healthy look to the hair. We recommend this as an affordable option for pros who are used to using curling irons and need better success and less frizz. Users are happy to report that this product gives them great, long-lasting results and is a great iron for an excellent price. 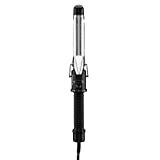 This curling iron boasts a ceramic barrel with an automatic rotating feature that makes styling faster and easier. The easy-to-use digital temperature control screen has plus or minus buttons to adjust the temperature as needed. You can straighten, curl, flip, and style your hair easily and the quick thirty-second heat-up offers fast styling action. This trusted hair-care brand brings us the affordable Infiniti Pro that won't fry your hair to a crisp thanks to its ceramic coating combined with tourmaline on the barrel. These materials help reduce frizz and prevent heat damage. This model excels at creating beachy waves and natural looking curls. The barrel is conical shaped and tapers from one inch to one half in diameter. This helps curls look more natural instead of perfectly uniform. 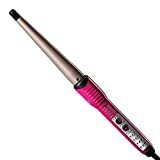 This best curling iron is a great option for all hair types from fine to thick and curly. A few users who claim to have "bone-straight" hair that doesn't typically hold curls are happy to report that this curling iron gives them volume and a beachy look. It only takes ten minutes to style, and it will last for two or three days. Users love this best curling iron for its versatile, interchangeable barrels, ceramic PTC self-regulating heat, and professional-grade results that last all day long and never tire out. Although its price is huge, this curling iron is a beauty award winner and is loved by many users with many different hair types. 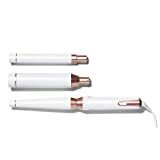 This curling iron is an excellent option for hair of all types and is an amazing product that many users are quite pleased with. Even those who have long straight hair that normally takes forever to curl will be excited to see the results of this easy-to-use product that does all the hard work for you. This curling iron offers a luxurious finish and professional results every time. The barrel is smoother, harder, and longer-lasting for years of excellent results. 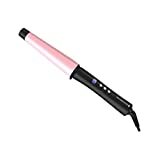 The high temperature of this curling iron makes it great for thick hair that's normally unruly and puts you in control so you can achieve the look you've been desiring the most. We hope our list of the ten best curling irons has given you a few substantial choices for your next best curling iron. 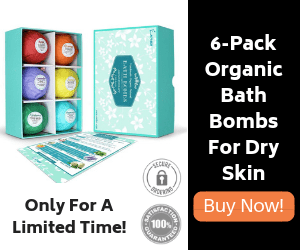 Pick out your favorite from our list and follow its Amazon link to find out more information and purchase it for yourself. What are you waiting for?